To look at people as individuals can be challenging. Every day, we give and receive feedback about different aspects about ourselves. Some of these aspects are used to categorize people with labels or terms. Often this categorization or labeling focuses on a visible aspect of a person, as though this were the only way to identify the person. How might one feel to be told, "Oh, you're a man. What do you understand about sexual harassment?" or "We are so glad you are now working here. We need the viewpoint of a Latina," or "Why should you care about affirmative action, you're not Black." Few of us escape the tendency to buy into the labels of identity, although they may be limiting. The Dimensions of Personal Identity model can be used as a paradigm to see people more completely, as well as an educational tool. It provided a reference point for recognizing the complexity of all persons. The model highlights our different identity-based affiliations, memberships, and subcultures and, therefore, complements the discussion of multiculturalism. A Dimension. The A Dimension is a listing of characteristics that served as a profile of all people. The majority of the dimensions we are born into, making most "fixed" and less changeable. For example, our age, gender, culture, ethnicity, race, and language are predetermined. We have no control over these when we are born, and there is very little we can do to change most of these dimensions. Some research suggests that sexual orientation is biologically based, whereas other data promote a sociocultural explanation. In the model, sexual individuals, it has been possible to transcend economic roots. Social class status, however, may persist for generations based on one's culture or society. For example, in India this may occur through the caste system, whereby individuals are born into a caste, complete with its privileges and limitations. In the U.S., social class may play out differently based on historical and familial lineage. One artifact of social class status is the social register, which accords a listing for some at the time of birth. For better or worse, attributions and judgments are made about all of us based on our social status. At times, this is less visible or known. Nevertheless, appearances are often used to make assessments of individuals' "value." How someone dresses, their "attractiveness" is terms of height, weight, and other physical criteria also interact with A Dimensions. Would a counselor respond similarly to an overweight, White woman as he or she would to a professional, Black woman? How might his or her previous experiences, or lack thereof, with these types of women affect his or her assumptions, comfort, and behavior in a counseling encounter? If placed on a continuum, all of the A Dimension characteristics can bring positive and negative reactions. Because they tend to be more visible, they invite feedback, both wanted and unwanted, from others, thus contributing to self-concept and self-esteem. It is the A Dimension characteristics that invite and challenge counselors to operate from a framework of multiculturalism and cultural competence. 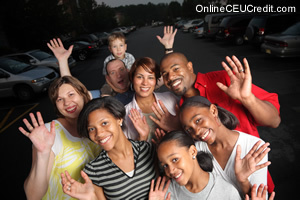 Because each person holds a cultural identity from one or more of the five groups cited, and because individuals embody all of the A Dimension characteristics, to be culturally effective counselors need to see individuals holistically, not in terms of color, ethnicity, culture, or accent alone. People are complete packages, as is described in the B and the C Dimensions. Ethics - C Dimension. The C Dimension is discussed next because it also encompasses universal phenomena. This dimension indicates first of all that all individuals must be seen in a context; we do not exist in a vacuum. The C Dimension grounds us in historical, political, sociocultural, and economic contexts indicating that events of a sociopolitical, global, and environmental form have a way of affecting one's personal culture and life experiences. The time one is born is an historical moment that will never happen again. In presentations, participants are encouraged to think about the following: How was your family life at the time of your birth? What was taking place in the local community or in your home country? What was going on in the world? Reflecting on the questions and the data that emerge provides individuals with a landscape for their personal history. Individuals who were born during the pre- or post-World War II period, have different recollections of their families. Many talk about their fathers being away during their childhood and the relief felt when they returned. African Americans also share recollections of their parents or grandparents serving in all-Black units in the military. Many Americans are unaware that Native Americans, because of their linguistic abilities, were involved in decoding communication among enemy camps. Because U.S. history books are written from a Euro-American, monocultural perspective, the experiences of individuals and families of color are often unreported or minimized. One example is the mode of entry historically experienced in territories recognized today as the United States. Blacks were brought as slaves to the North and South American continents. Native Americans and Mexicans populated the continental territory, but were subsumed under American jurisdiction as a result of treaties. In other words, they became conquered people. The island of Puerto Rico was colonized by the Spaniards and today it is an American commonwealth. The Japanese and Chinese were brought as laborers to the Northwest to build the new frontier. For millions of people, the U.S. did not represent the land of freedom. This lack of knowledge can place a counselor at a disadvantage because all he or she can reference is his or her personal experience. 'Revisionist" versions of American history, as they are called, are providing missing information that again highlight some of the experiences of Americans marginalized based on cultural, ethnic, and racial differences. B Dimension. The B Dimension is discussed last because theoretically it may represent the "consequences" of the A and C dimensions. What occurs to individuals relative to their B Dimension is influenced by some of the immutable characteristics of the A Dimension and the major historical, political, sociocultural, and economic legacies of the C Dimension. Educational experience is one example. Many more women and people of color have pursued higher education in the past 25 years as opportunities and access have become more possible because of Title VII of the Civil Rights Act. As a result of this legislation, colleges and universities can no longer discriminate based on gender, race, religion, and so forth. With increased levels of education, the work experience and parental status for women looks more varied than it did 25 years ago, although in terms of earning power, it does not equal that of White men. Education and socioeconomic conditions can enhance or limit a person seen only through the lens of an A Dimension. What happens to individuals is not totally within their control despite the American myths about self-control and self-reliance. Enabling conditions also play a role in what one can access or even think about. Laurence Graham, a Black author and lawyer, spoke to the Boston Human Resources Association in November 1994, about the reactions of his White peers when they learned he had been accepted to Yale. Rather than congratulating him, they stated that he had achieved entry as a result of affirmative action, thus diminishing his achievement. Graham also reported that many of his peers, not his par academically, were still admitted to prestigious universities. Why? As Graham noted, they had their own form of affirmative action, entry based on family legacy, connections, and so forth. The difference was that no one questioned this practice; things just worked that way. One wonders how a high school counselor might see these two different sets of experiences. How aware and knowledgeable are counselors about the issues of access as they relate to the B Dimensions? For most people of color in this country, access has been restricted legislatively and has been based on interpersonal discomfort and racism. In the CEO ranks, women and persons of color are sparse. Even going to the right schools may not always help. Why? As the literature indicates, organizations tend to hire in their own image, and historically this has been a certain type of White man. How might this information assist a therapist who sees a woman or a person of color who has again been passed over for a promotion? Chances are that encouraging the person to "try harder" will not provide the appropriate empathy. To be culturally competent, counselors need to understand the political power dynamics of the workplace and how they perpetuate the dominance of certain groups over others. With this knowledge, counselors can respond more effectively to the reality of the client's experience. - Arredondo, Patricia et al..; Operationalism of the multicultural counseling competencies; Journal of Multicultural Counseling & Development; Jan 1996; Vol. 24, Issue 1. The preceding section contained information about the dimensions of the personal identity model. Write three case study examples regarding how you might use the content of this section in your practice. What are the three dimensions in the Personal Identity model?